Our Abpromise guarantee covers the use of ab6982 in the following tested applications. Neutralising Use at an assay dependent concentration. This antibody will neutralize Ad5 infection in a bioassay (1/25,000 dilution for 50 % inactivation of Ad5at 1000 particles/ml). Recognizes Ad5 immobilized on microtiter plates. Adenoviruses are DNA viruses that cause upper respiratory tract infections, conjunctivitis, and other infections in humans. Adenoviruses were discovered in 1953. About 47 different types have been identified since then, and about half of them are believed to cause human diseases. Infants and children are most commonly affected by adenoviruses. Adenovirus infections can occur throughout the year, but seem to be most common from fall to spring. Adenoviruses are responsible for 3-5% of acute respiratory infections in children and 2% of respiratory illnesses in adults. Immunocytochemistry/ Immunofluorescence - Anti-Adenovirus Type 5 antibody (ab6982)Image courtesy of an anonymous Abreview. 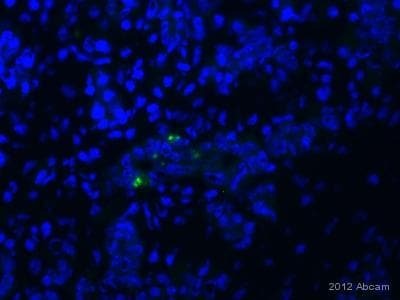 ab6982 staining Adenovirus type 5 in human HeLa cells by Immunocytochemistry/ Immunofluorescence. The cells were fixed in paraformaldehyde, permeabilised in 0.1% Triton and then blocked using 0.1% BSA for 16 hours at 4°C. Samples were then incubated with primary antibody at 1/800 for 1 hour at 37°C. The secondary antibody used was a donkey anti-rabbit IgG conjugated to Alexa Fluor® 546 (red) used at a 1/1000 dilution. Top blot (A): ab6982 at a 1/4000 dilution staining Adenovirus type 5 capsid proteins by Western blot (ECL). Secondary = goat anti-rabbit (HRP conjuagte). Bottom blot (B): As above, except ab6982 omitted. Top blot (A): ab6982 at a 1/4000 dilution staining Adenovirus type 5 capsid proteins by Western blot (ECL). Secondary = goat anti-rabbit (HRP conjuagte). Bottom blot (B): As above, except ab6982 omitted. Additional information regarding Adenovirus type 5 capsid proteins. 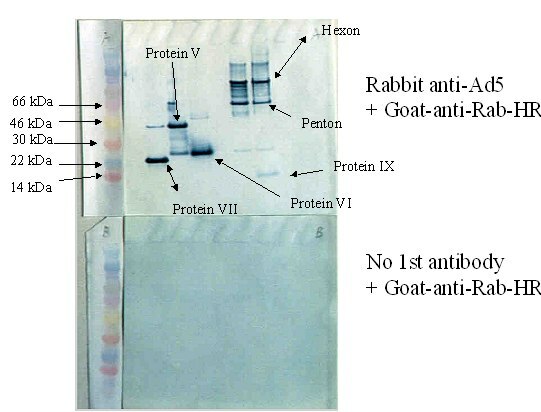 Western blot - Anti-Adenovirus Type 5 antibody (ab6982)Image courtesy of an anonymous Abreview. Lane 1 : Whole cell lysate prepared from U2OS cells. Lane 2 : Whole cell lysate prepared from U2OS cells infected with Adenovirus 5. Blocking step was performed using 5% milk for 1 hour at 23°C. Publishing research using ab6982? Please let us know so that we can cite the reference in this datasheet. I would like to buy your anti-adenovirus type 5 antibody (ab6982) and am wondering if your antibody can target Ad type 5 knob domain??? Could you check it for me? ab6982 is a plyclonal antibody and as such shows recognition to every protein in the Ad5 capsid, including the knob. It may be possible to reduce the cross-reactive signal by alterring some steps of the protocol. Could you tell exactly in wich step please? If the specific signal is fairly strong, you can further dilute the antibody to 1:200-1:1000 which should help reduce non-specific binding. You could also try blocking the tissue overnight at 4C, and continue to use the 1:5 serum for blocking. We can alternatively issue a credit or refund for your original purchase. Please keep me updated about any new results with ab6982, and let me know if you'd like to receive a replacement, credit, or refund. I look forward to hearing from you. If there is anything else that we can do for you please don't hesitate to ask. I'm using Ab6982 in parafined tissues immunohistochemistry and I get lot of crossreacting signal, with canine eritrocites and other unspecific tissues. Do you have some kind of explanation or knowledge about that? Any other crossreacting signal Known? Thank you very much for contacting us with your question, and for your patience while I have been in touch with the lab to request more information about this antibody. Guedan S et al. Hyaluronidase expression by an oncolytic adenovirus enhances its intratumoral spread and suppresses tumor growth. Mol Ther 18:1275-83 (2010). The immunogen was a pharmaceutical grade purified virus so we expected minimal cross-species recognition. The virus was grown in mammalian cells (HEK 293) so it's possible that there may be some cross recognition to other mammalian targets, but unfortunately we do not know what specific proteins the antibody would cross-react with. It may be possible to reduce the cross-reactive signal by alterring some steps of the protocol. At what dilution are you using the antibody? What kind of blocking solution do you use? Could you describe the antigen retrieval protocol that you use? I look forward to hearing from you. We do fully guarantee this antibody to work in IHC on paraffin-embedded tissue for up to 6 months after purchase, so I can issue a replacement, credit, or refund if you are not satisfied with the results. If you would like to accept one of these options, please let me know your original order or PO number and I'll set this up promptly. No signal in transfected HEK cells. I am sorry that you are not getting any signal using the current lot of ab6982. As we discussed, I am sending you a new vial of ab6982 to use. Your new order number is */. If you have any difficulties with the new vial of the antibody, or if there is anything else I can help you with, please let me know. Our customer would like to purchase adenovirus antibody which reacts to serotype 5. I searched ab6982 but I'm not sure type 5 and serotype 5 are the same mean. Targets all capsid proteins of Adenovirus type 5, including hexon, fiber and penton. Cross reacts with other serotypes of Adenovirus. Please let me know if it is right one. Yes, I can confirm that "Type 5" is a shortened version of the more scientifically precise term serotype 5. They both mean exactly the same.All Adenovirus classification is based upon serotyping. This antibody ab6982,was raised against serotype 5 Adenovirus. do you have anti-adenovirus antibody which have the same specificity as ab6982 but biotin-labelled? Since the antibody comes as whole antiserum, it would need to be purified before the conjugation reaction, using an Antibody serum purification kit (1 (ab109208) or 3 purifications(ab109209)). I will also check with the lab if a custome conjugation might be possible, but if it would be possible, it would require an orderof at least 10 vials. I will let you know what I find out.